Chances are, you’re a good writer who tries hard to follow the rules. But, every now and again, you run into language situations -- circumstances that make you question whether or not your recollection of the rules is serving you well. 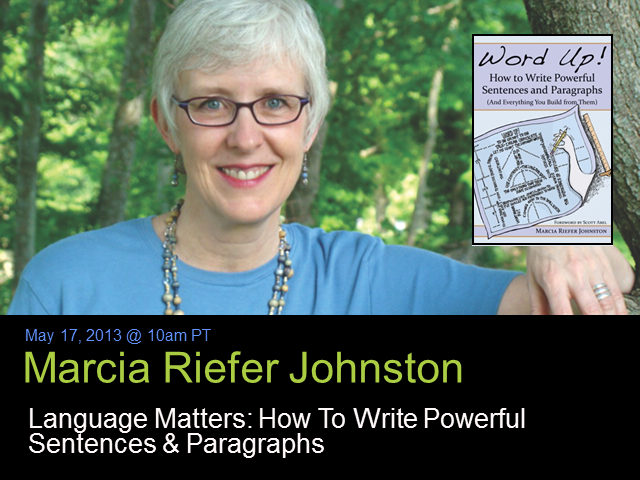 Join Scott Abel, The Content Wrangler, and Val Swisher, CEO of Content Rules, Friday, May 17, 2013 at 10am PT/1pm ET for a discussion with wordsmith extraordinaire Marcia Riefer-Johnston about language rules that matter (as well as some that don’t). You’ll be delighted by Johnston’s entertaining view of language and stories about how we use it. And, you’ll be give the opportunity to pose questions about words and their usage to one of the writing industry’s best and brightest. Ten attendees will receive a free copy of Johnston’s recently released book, “Word Up! How To Write Powerful Sentences and Paragraphs (And Everything You Build From Them)”. The book is loaded with useful, practical advice for improving your writing by making good use of the rules that matter. It’s more than a book about grammar and writing. It’s a book designed to help you take command of the words you use and wield them in powerful ways. When Marcia was twelve, American Girl magazine printed her eight-paragraph story, "The Key," and paid her $15. She has been writing ever since. She has worked as a technical writer for 20+ years, including a stint teaching tech writing in the Engineering School at Cornell University. Her words have landed on billboards, blackboards, birthday cakes, boxes of eggs, and the back of her new book, "Word Up! How to Write Powerful Sentences and Paragraphs (and Everything You Build from Them)."